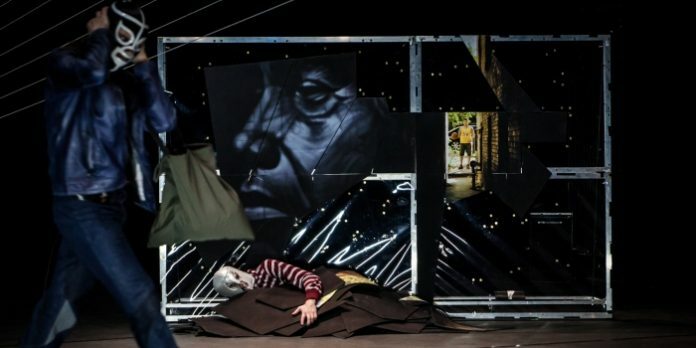 [pullquote]Breaking the boundaries of theatre, Lachambre creates a strong connection with his audience through Snakeskins, in a piece that is proactive, hypnotic and magnetic. [/pullquote]The answer came soon enough as the puzzle was completed and moved inside the theatre with spectators in tow, revealing a stage of metal scaffolding and hundreds of feet of white rope. As Lachambre hung on the scaffolding, playing with gravity by suspending his weight, it gave the impression of heavy, painful and dangerous movement. Thanks to the fluctuations of the dancer’s spine though, the movement transformed into energy, and it became light; the power of dance felt as though it was transferred to the audience. Snakeskins was inspired by an exercise called “water snake” that Lachambre uses in his dance practice which works on vibrations, undulations and fluctuations of the spine. However, in this visual dance piece, not only does the body vibrate, but the entire setting. The sound of metal sheets, the movement of ropes and the wonderful light, created by Yves Godin, created a hypnotic environment that at times was comparable to an earthquake. Lachambre took the audience with him on his trip, or perhaps more accurately, on his trance. At one moment he moved his neck incredibly fast, reinforced by Godin’s light and Hahn Rowe’s music which gave the illusion of two faces and only snapshots of this moment could be captured. The most hypnotic vision though came as Lachambre moved the ropes with vibrations, evoking a breathtaking image of flames and waves. The projections of lights and the trembling ropes created an incredible picture of pure energy that, quite literally, became visible on stage. Breaking the boundaries of theatre, Lachambre creates a strong connection with his audience through Snakeskins, in a piece that is proactive, hypnotic and magnetic. Par B.L.eux’s Snakeskins is presented as part of the Vancouver International Dance Festival until March 14 at the Roundhouse Community Centre (181 Roundhouse Mews, Vancouver). Visit http://vidf.ca for tickets and information.